Free Printables, Free Royalty Free Clipart and Fonts? Yes, you can! If you are looking for downloadable editable printables for the classroom check out TeacherSherpa. It is similar to Teachers Pay Teachers, but offers so much more. The printable curriculum is editable and fully customizable. Like TPT, there are free printable downloads available every month. Whether you are a teacher, a blogger, or a homeschool parent, you'll find awesome benefits on TeacherSherpa. 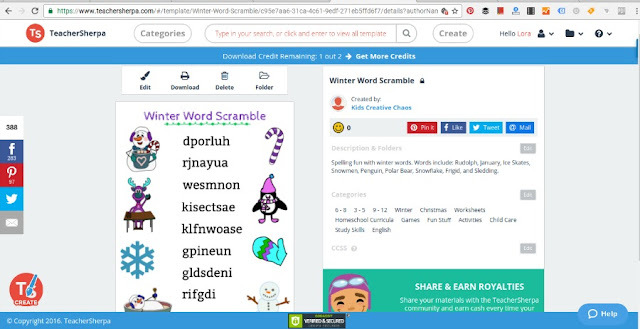 The most amazing feature is that you can create your own printables to sell on TPT, earn royalties on TeacherSherpa, or even sell or giveaway on your own website. Enjoy! At TeacherSherpa, you can make your own classroom materials and editable printables for free. 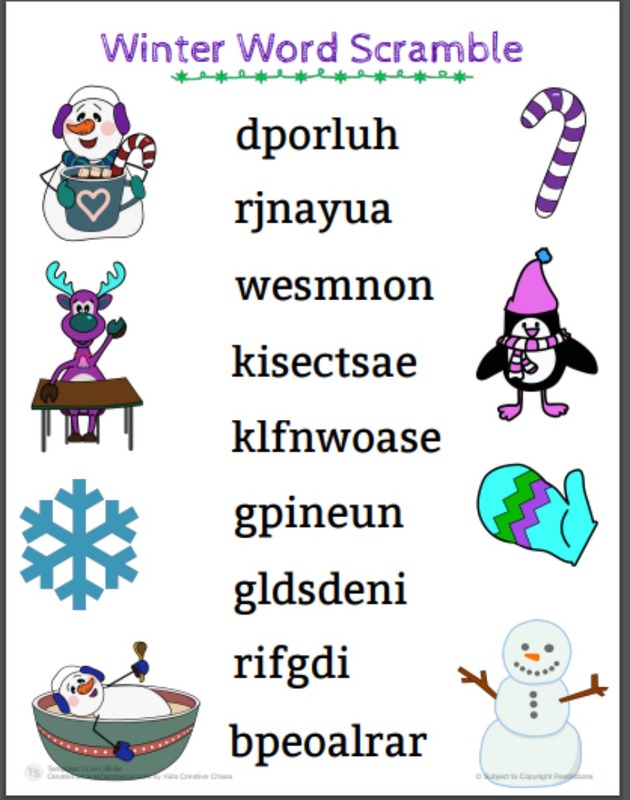 Winter Word Scramble free printable to download. As a teacher, TeacherSherpa offers you all of the benefits of TPT and more. Not only can you search hundreds of educational printables to download for your class curriculum, but you can edit those printables to fit your needs. And, as they say, that's not all. 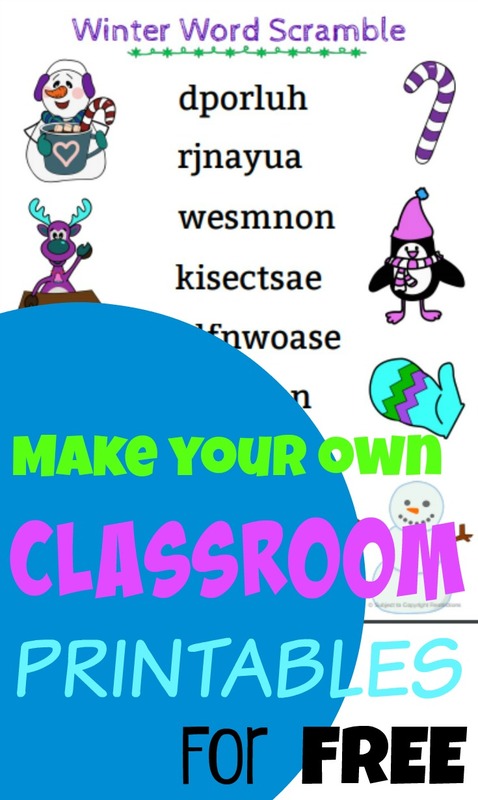 You can create your own classroom materials to use in your class or to share on TeacherSherpa and earn royalties! Are you a teacher/blogger? Read on for more great benefits. My fellow bloggers, I love TeacherSherpa! Every benefit listed above for teachers is available to you. But wait, there's more! 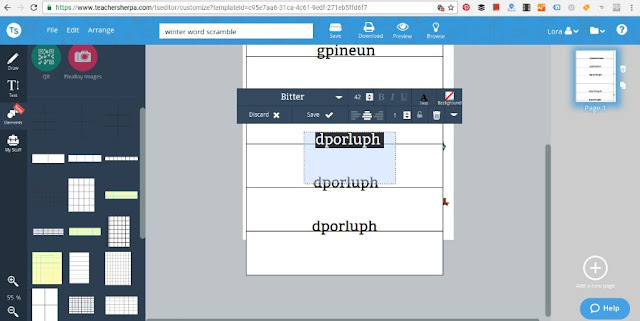 You can create whatever you want on TeacherSherpa. Can't find the clipart you want, just let TS know, and they'll add more clipart for you! Think PicMonkey for eBooks! You can create a pdf eBook right on the website. All of the fonts and clipart images are royalty free. For FREE. What you create is your content. You own it. You can use it anywhere. You don't have to use it on TS. There's no catch! Coming this weekend, you'll be able to upload your own materials to TS. This means you won't have to work to create new materials if you already have them. Just upload what you have created elsewhere. If you have materials on TPT or your website, you'll be able to upload those to TeacherSherpa and start earning royalties. However, this is not a requirement. It is only offered as a benefit for those who regularly create free printables and want to earn a little extra. If that isn't an appealing option to you, there are other ways to make affiliate income. Create your own multiple page lessons or books too. Remember, the artwork on TS is designed in-house, so you can take it anywhere with no worries of copyright infringement. It is yours! You may notice a disclaimer about copyright restrictions on your printables. This is designed to protect you from others who may try to sell the printables that you create. You must purchase a paid subscription to TS to download your items, but you don't have to do that to try out the creator tools. Use TS as a promotional tool for the freebies you sell on your website, TPT, or anywhere else. You can sign up to get a referral code. With every referral for a premium subscription, you'll earn $10. (Everyone can do this! Teachers, homeschoolers, anyone who take the time to sign up!) Once you sign up as a referrer, whenever your TeacherSherpa pages are shared on social media, you'll get the referral. As a blogger, the possibilities are endless! Here at Kids Creative Chaos, we're busy making printables to offer as both free printables and eBooks on our website. Scroll down for our free sample. No worries about copyright infringement, where to find clipart for unlimited use, or paying for costly images or clipart services. TeacherSherpa has their own design team working for you! So, you are still suspicious? It sounds too good to be true, right? TS is still in the growing stages, they are learning the ropes- especially when it comes to blogging. The founders are teachers. It truly is a win-win situation. Their goal is to get paid subscriptions. Think Netflix and Pinterest had a baby that wants to help teachers easily find and create classroom curriculum. That's it. Try it! If you have questions or concerns, send me a note or contact TS- the founder will sit down with you for a one on one tutorial! If you are a homeschool parent constantly looking for printables that just aren't quite what you need, the search is over! You have a choice- make your own or search the TeacherSherpa database for the science, math, language arts, foreign language, music, or art lesson that you want and then edit it to fit your needs. It is easy and super addictive! Step One: Sign Up for free! When you sign up, be sure to join the TeacherSherpa referral program. When people activate to a premium membership, you'll get a $10 referral fee. Once, you've signed up you have two free material downloads per month. If you want more than that, you'll need to become a paid member. With all of the bells and whistles, the membership is worth it. Especially, if you regularly make printables for the classroom or to sell on your website. This step is a learning curve. The best advice I can give you is to remember to SAVE and save often. Especially, before you do a preview. My little word scramble took me about 2 hrs. of trial and error- not including the time I spent playing with the color editor for my clipart images. You can edit every aspect of the images. I love choosing my favorite signature colors for each character. Be patient. It takes a few seconds for the image to appear on your work. I ended up with 10 reindeer that I had to delete. Same thing with text editing. It seems laggy (it could have been my internet). To edit text, you will need to click twice to highlight where you want to edit and then wait a second for it to work. Because it works in layers, (like Picmonkey) you'll need to move things forward or backward. During this process, you may think you've lost something. Just click the top layer and then right click to see the list to move it to the back of your work. Truth: I got frazzled and had to step away. When I came back later, (with more patience) it was easier to comprehend what was happening. While they are new and still working out the bugs, I blame my frustration on operator error. Plus, I didn't take the time to watch the tutorials. You should do that! You have options. 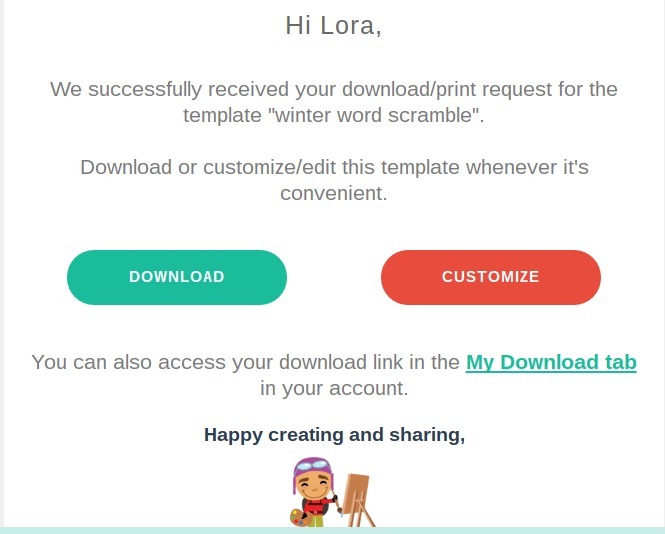 You can download it to your computer, (which counts toward your two downloads per month) or publish to the TeacherSherpa wall to offer it to others and earn royalties. The best part is, you don't have to choose! I did both. I have this Winter Word Scramble available on TeacherSherpa and I'm sharing it at the bottom of this post as a free winter printable. As a blogger, I'm using TeacherSherpa as a way to promote my free printables and my website. If I make some pennies while I'm at it- Hooray for me! Step 4: Set Up for Download on TS! If you choose to 'publish to wall,' your printable will go through a review process before appearing available on TS. While you're waiting, go edit the landing page and choose categories so that it can appear in the right searches on the TS Inspiration Wall. 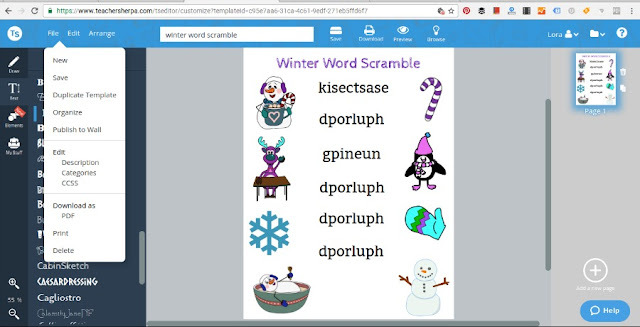 Step 5: Download or Customize to Share on your Site or TPT! 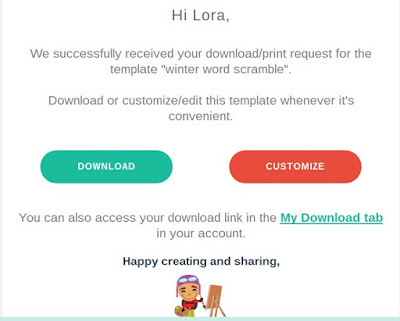 If you choose to download your editable printable, TS will send you an email for easy access. Just click download to add it to your computer. You can also download it from the TS dashboard. Remember, this counts toward your two free downloads per month. Learn more from the TeacherSherpa co-founder: Create on TeacherSherpa. Find inspiration to create your own free printables. Oh, and best of all- you don't have to sign up to get started with the creator tool. Hop over and try it now. Tip: The code only works once, so I'd use it for a yearly subscription rather than a monthly one. Remember, you don't need to subscribe or sign up at all to use the free creator tool. Without a subscription, you can get up to two free downloads every month. Whether it is a one page lesson activity or a 50 page eBook, it still counts as 1 download. I make free printables for my homeschoolers and for an afterschool program, so this is ideal for me. If you don't have the time or patience to create your own materials, no worries, you can edit the work of others. Here's my word scramble printable. Winter Word Scramble Printable Free to Download. Our Homeschool Projects are perfect for homeschoolers and classroom teachers.